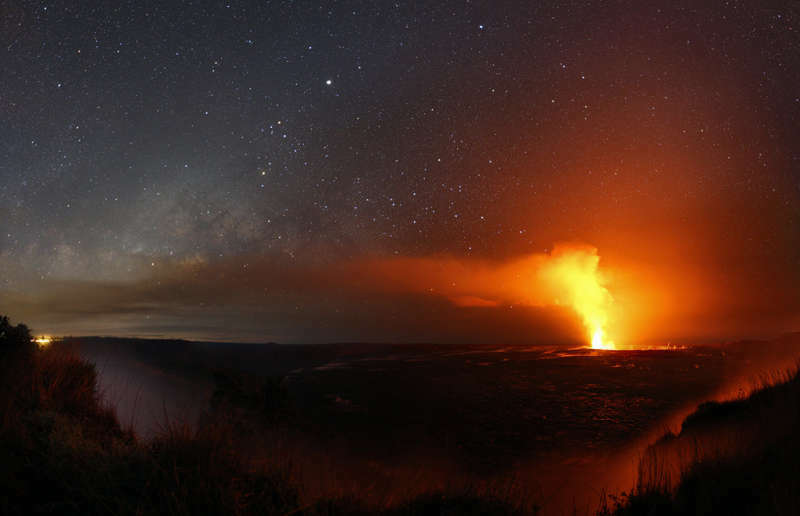 Explanation: Volcanic activity on the Big Island of Hawaii has increased since this Hawaiian night skyscape was recorded earlier this year. Recent vents and lava flows are about 30 kilometers to the east, the direction of the blowing smoke and steam in the panoramic view of the Kilauea caldera with Halemaumau crater taken from Volcanoes National Park. Still, this year Jupiter is bright in late spring to early summer skies. High in the south it is easily the brightest celestial beacon in the scene where the central bulge of the Milky Way seems to rise above vapors and clouds. Yellowish Antares is the bright star near the end of the dark rivers of dust seen toward the center of our galaxy. Near the horizon, stars Alpha and Beta Centauri and the compact Southern Cross shine through the almost too bright volcanic smoke.